Come Back, Robert Bork! All Is Forgiven. Robert Bork is relevant again. He’s signed up as an adviser to Mitt Romney’s presidential campaign. He’s giving interviews. He’s giving Joe Nocera hooks for odd slow-news-day columns, like this one about how Robert Bork’s nomination fight “was the beginning of the end of civil discourse in politics.” Charles Sumner, call your office! The character assassination began the day Bork was nominated, when Ted Kennedy gave a fiery speech describing “Robert Bork’s America” as a place “in which women would be forced into back-alley abortions, blacks would sit at segregated lunch counters,” and so on. I think what Nocera is trying to say is that Bork is/was an interesting character, and to go purple when talking about his belief system was to assassinate him. Because… well, which of the two things Kennedy said are untrue? If Bork had been in the SCOTUS in 1973 and cast a deciding vote against Roe, would there have been more black market abortions? Well, yes. Abortions would have remained totally illegal in many states. If he’d been in the Court in the 1960s, would he have opposed the Civil Rights Act? Well, he did oppose the Civil Rights Act. He said at the time that “the principle of such legislation is that if I find your behavior ugly by my standards, moral or aesthetic, and if you prove stubborn about adopting my view of the situation, I am justified in having the state coerce you into more righteous paths.” He doubled down: “That is itself a principle of unsurpassed ugliness.” Lloyd Grove asked him about that this year. That was a reflection of what I thought at the time, because I said it. But, heck, it was a long time ago. And it turns out that the transition to a non-discriminatory society was much easier than I thought it would be. I am now perfectly happy with the way things turned out. This is quite a lot like Bork’s answer to a Civil Rights Act question in the 1987 hearings. 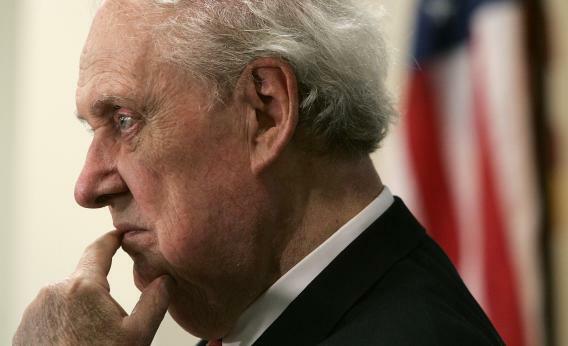 Sen. Gordon Humphreys tossed him a softball disguised as a hardball – “Are you a racist?” – and Bork said, well, his old opposition to the CRA was just sort of wrong. The only thing I ever did was, in my libertarian phase, doubt that law should be used to overcome private immorality. I have since decided that law should be used to overcome that private immorality, but I have – you will never find in any of my writings anywhere, or any of my statements anywhere, any statement or writing in any way supporting or favoring racial segregation or discrimination. Why is this supposed to be convincing, or prove that Bork, if given power at crucial times, would have struck out against civil rights laws? Why was it character assassination to point out that Bork once believed that anti-racism legislation was odious state coercion – and that he explained this away by saying he was going through a “phase”? And while we’re on it, this proves that Bork was an intellectual without peer… how, exactly? No, Nocera doesn’t make any kind of case at all. Not even the closer makes sense. The next time a liberal asks why Republicans are so intransigent, you might suggest that the answer lies in the mirror. Bork’s nomination was defeated in a bipartisan up-or-down vote, 58-42, with six liberal Republicans joining the “nays.” Liberals are more angry now about Republican intransigence because they won’t let bills get up-or-down votes. Now, Democrats played a big role in establishing that standard (Miguel Estrada, go to the waiting room with Sumner), but it has nothing to do work the standard set by the Bork nomination.